Today is Holocaust Remembrance Day, and in honor of so many family members that I never had the opportunity to meet, I am remembering this day in my heart and discussing it in my blog. My pictures today will be graphic and disturbing, so I'm warning you. Don't look if you think looking at the results of the Concentration Camps will ruin your day or whatever. YOU'VE BEEN WARNED. Unlike many survivors, my parents discussed the events of WWII, at least in general terms. But they rarely talked about the specifics. 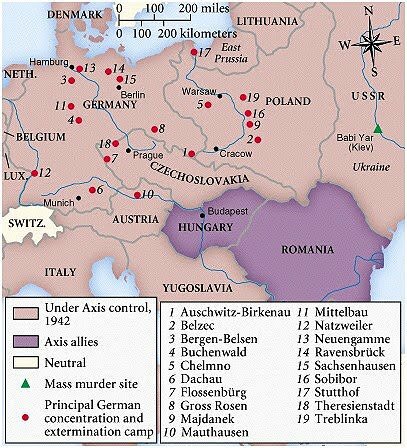 I had to do the research on my own, and have been researching the Work and the Death Camps on and off for most of my life. Many members of my family lost their lives in these camps, so it was and remains important to me. My aunt, who had been an opera singer in Prague, Czechoslovakia, was rounded up and sent to Terezin - the "model" camp. She sang for her life there, along with other musicians, artists and performers, and she managed to survive. My uncle, her older brother, and his new wife were shot, my father survived by walking through Europe with a black-market passport he purchased that didn't have the "J" marking that indicated Jew. After some close calls he finally managed to get out of Europe and into the US. My father, my aunt and their half-brother were the only survivors in their family. 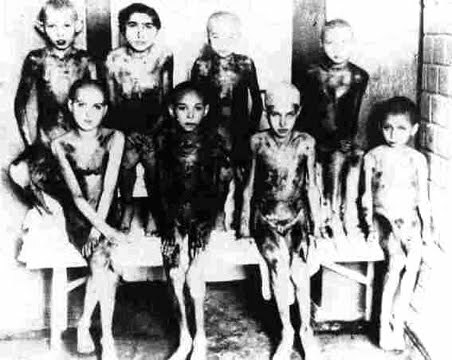 Children in the camps were rare, but this group managed to survive. My mother's family was based in Vienna and Yugoslavia. My mother and some cousins were the only survivors. My mother was one of thirteen children. My uncle (mentioned above) taught after the war. As a specialist in a particular historical period (the Jacobean time) he lectured in Tel-Aviv and in Frankfurt, splitting his time. I met him once when he came to Colorado to see my Dad once before they both died. At that time he told me that he had toured Auschwitz and that my grandfather's trunk was on display there. I don't know if that is still the case, but it is something that I've remembered for my entire life. 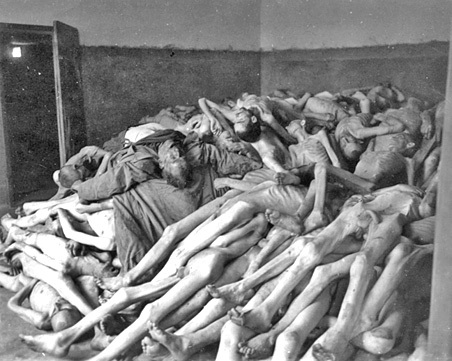 These bodies were found stacked at Dachau when it was liberated in 1945. So today, when you think about your relatives and your lives, spare a thought for those who lost their lives in the Camps. It WASN'T just the Jews who were slaughtered in these machines of death. It was the Jews, the Gypsies and those identified as Homosexual. Don't forget all of these people whose liberties ended and whose lives were taken because of their religion, race or sexual inclinations. What we don't learn from we are doomed to repeat. Don't forget - NEVER FORGET. Thank you. The blinders that some people put on baffles me as well. It's interesting that today is also remembrance for two other holocausts. Waco and Oklahoma city bombings. Perhaps not on the same scale as the pogroms of the WW2, but just as much worth remembering for the stupidity that started them. And "never forget" is something pagans say about the Burning Times. How things all seem to come together. I wasn't aware that the day was shared with Waco and OK City, that was very interesting information. Thanks for sharing your family's story. My great-grandparents left Eastern Europe in the 1920s, so fortunately none of my extended family members were in the camps. Indeed, we should never forget, even though genocide has persisted throughout the 20th century and in to the 21st. I grew up with many people who never knew a grandparent. In fact, when I finally met people who had grandparents, I wondered why they did and how they interacted with them. Those of us who are children of Holocaust survivors have our own unique issues :-) Thank you so much for reading something that was, undoubtedly, uncomfortable. My English teacher was Polish and she survived the concentration camps when a child. However, she said it had a long term effect on her health when an adult - she had a whole host of long term conditions. We all loved her; she treated her pupils as people. How interesting. She was a remarkable person because she did something that few others managed to do. I love the fact that you think she treated her students as people - that's quite the tribute.